Career Insights: What Does a Network Engineer Do? In this edition of our Career Insights series, we’re taking a look at the role of a network engineer and discussing what exactly they do, the skills required, and the average salary an experienced network engineer can expect to make. What’s the role of a network engineer? Network engineers are responsible for the delivery and maintenance of computer networks within an organization. Essentially, network engineers are responsible for ensuring their clients can get online simply, securely, and reliably. They’re focused on providing a stable network and maintaining servers for a consistent connection. Typical duties for a network engineer can include implementing network solutions, troubleshooting performance issues, configuring security systems, and maintaining the network infrastructure for maximum performance for clients. Traditionally, you will work Monday until Friday on standard working hours. But you will need to be available at weekends or outside business hours if technical problems arise. Larger companies will often have graduate schemes where they recruit graduates straight into their IT teams to offer on-the-job experience and training. However, employers may also accept candidates who have a lot of experience even if they do not have a degree. The role of a network engineer is always varied, so it is difficult to pinpoint the exact technical skills you will need to perform well in this role. There are a number additional certifications engineers can do to further their expertise in this filed. Probably amongst the most popular are Cisco certifications and its engineering program, which offers five different certifications to provide further training. 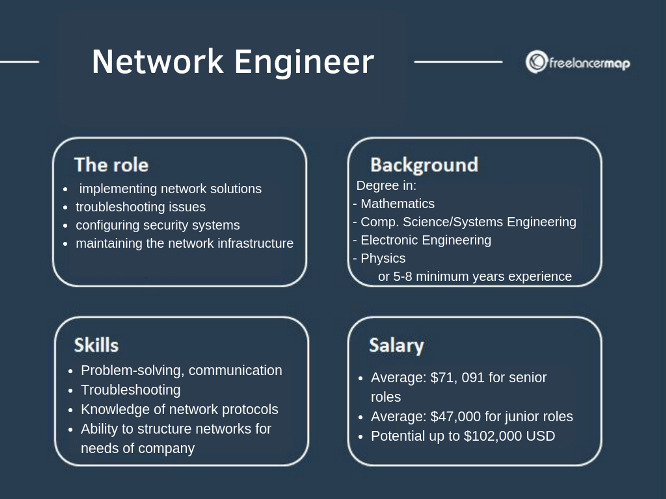 The average salary for network engineers in the USA is $71,097. However, this may be dependent on your experience and the size of the company you work for, as the minimum salary is estimated to be $47,000 with the maximum at around $102,000. According to the freelance rate index at freelancermap, the average rate for freelance network engineers is $70 /hr (freelancermap freelance rate index November 2018). Can network engineers be freelancers? The short answer is yes, it is definitely possible to be a freelance network engineer! Experienced network engineers are in high demand these days, and working as a freelancer means you can work from home and offer your services to businesses in different cities - or even different countries. Your responsibilities will be the same as a freelance network engineer as they are when you work for one business directly, but communicating with your clients will become even more important. Additionally, a freelance network engineer will need to be comfortable working long, irregular hours, and even some weekends. Network engineers can be on call for 24 hours a day if something goes wrong, so you need to be prepared for that circumstance when you take on a bigger client. Are network engineers in demand? The online world is still new and constantly changing, and for this reason, network engineers with an in-depth knowledge of network systems are in high demand. What’s more, there are still many different avenues a network engineer can take to become more specialized in a certain field - and with more experience, specialists are in extremely high demand. The best approach is to continue learning and ensure you stay up to date with the latest systems and best practices to stay in high demand with your clients. Who is hiring network engineers? You can work for any company with its own large IT systems or work for companies that outsource their complete IT systems to specialists. Seeking a Network Engineer to structure, put into place, and monitor our infrastructure as we expand it. Must be able to work with a variety of operational problems and work well within our systems team to create accessible network structures that work efficiently to meet our objectives. Design, plan and implement network tech that directly supports goals of the company. Revamping, restructuring, and implementing team-determined system standards. Build and test simulations to test issues within the network infrastructure. Work with team to uphold and maintain the network to its highest level of performance and promptly address issues reported by other departments. Understand a variety of tools and be able to explain them to the body of the company if need be. At minimum a Bachelor’s of Science relevant to network engineering or 5-10 years’ experience with credible references. Extensive knowledge of network protocols such as TCP/IP, DNS, and DHCP. Proficiency in troubleshooting technologies and problem-solving. Proficiency or certification in Cisco systems or other relevant tools.